Your Nordic Walking Order Is Our Priority! We pride ourselves with the expedited service that we provide to ALL our Nordic Ski Walking customers. Your NEW Nordic Walking Poles shipping with-in the USA (including Alaska and Hawaii), plus APO’s & FPO’s, will ship by USPS Priority Mail. Shipping is only $7.50 and additional poles, additional rubber tips and/or padded pole bags shipped to the same address ship FREE! Shipping Nordic Walking Poles to Canada is by USPS Air Mail and shipping cost is only $25.00 US Dollars. Additional Nordic Walking Poles, tips and travel bags ship FREE to the same address – no additional cost.. Shipping Nordic Walking Poles outside the USA and Canada is by USPS 1st Class (Air Mail) and is $35.00 US Dollars. If you are ordering Nordic Walking rubber tips only and would prefer lower shipping costs please call our toll free # 877-SKIWALKING (877-754-9255) and we will ship your rubber tips USPS 1st Class for $5.00 any where in the USA + APO’s + FPO’s. ALL Orders received by noon will ship out same day! BUY NOW. Hundreds of our Nordic Ski Walking customers have taken the time to thank us for our fast shipping, professional service and quality products. We would love to hear from you too. I just got my Nordic Walking poles….wow! That was fast. I just ordered them Sunday, and here it is Tuesday and I already have them. Going to look at the Nordic Ski Walking DVD tonight and with the help of your emailed ski walking instructions, I hope to be ski walking later today. 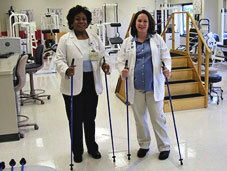 Thank you for promptly sending me the Nordic Walking poles. I only recently discovered this wonderful sport and am totally hooked. I took them out for their first walk as soon as I picked them up from the post office. They are nice and light and I love the Swix Nordic Walking strap system. Just thought I would let you know I received my Nordic ski walking poles today. Thank you so much for such prompt service. I returned home from work today and the poles were here, so I relaxed and watched the video and practiced a bit in the house. I then bundled up (it is 12 degrees here) and decided tonight was going to be my first Nordic ski walking trek. I usually walk 1/2 mile and that takes me forever. I have a very slow pace because of my lower back. Now, with these wonderful poles, I took off. I felt like I was flying. My pace was steady and strong, even while walking on snow and ice covered sidewalks. I have never had such a great aerobic workout with so little effort in my life. I am sitting here typing this and can feel the muscles in my upper back, arms, abs, buttocks and legs. I am anxious to walk again tomorrow. I walked a mile today and was not sore or winded. Thank you, thank you, thank you. I am going to take before and after pictures of myself and I will share them with you in about a month. I am so excited, thanks again!! Thank you for sending my new Nordic ski walking poles so quickly. I used them for the first time this morning on one of the rim trails where I normally walk. I loved using them!!!!! This walk is about 1 hour and except for some stairs (which I love cause it gets the heart going) it’s an easy trail. Well, this morning I could really feel my body working on the flat and downhill parts and I am extremely grateful to know that now my walking will be giving me a challenging workout. Since I am no longer running, ski walking feels like it just might give me a similar feeling. I love ski walking!!! I’m going to tell everyone to do it and buy their poles from you. Many thanks for my new found sport. I ORDERED MY Nordic Walking V.I.P.’S FROM YOU ON MONDAY AND THEY ARRIVED YESTERDAY. GREAT TURN-A-ROUND TIME!!! THANK YOU FOR A GREAT PRODUCT!! I have to tell you I am very impressed with the way you handled my Nordic Walking Pole order, especially on Easter Sunday. I am a student at Harvard business school and a general fan of customer service as well as of German origin. My compliments on your business: excellent service. Wow! That was FAST. I can hardly believe that my Nordic ski walking poles, which I ordered Saturday, arrived TODAY, Monday. You are running a very good business, in my opinion. I have been trying the poles inside and will now go and try a walk around the block. Thanks so much for being so quick with the shipping and in answering my many questions about Nordic Ski Walking.